For most of this year, we saw the steady global expansion underway since mid-2016 continuing, with growth during the 2018-19 period projected to remain at its 2017 levels. 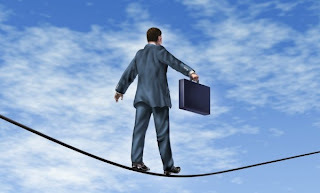 However, even with the International Monetary Fund’s (IMF) estimate of 3.7 percent growth in 2019, more downside risks to this growth rate have emerged in the past six to eight months, as political turmoil continues to spread to more places around the world. Here in the U.S, the Federal Reserve is still projecting GDP growth to slow to 2.5 percent in 2019 after 2018’s tax cuts helped boost annual GDP growth to 3.1 percent. Unemployment remains low at 3.7 percent, and, as of October, there were one million more jobs than there were people actively seeking work, which has put upward pressure on wages as the competition for skilled workers heats up. More recently, however, wild swings in the stock market due to escalating trade tensions with China and slowdowns in other developed countries have dramatically impacted the global appetite for risk, with the State Street Investor Confidence Index declining at the fastest pace in a decade over the last few months. Still, one positive side effect of this volatility for the housing market has been a recent escape to the safety of long-term bonds, helping to reverse the steady increase in mortgage rates. This, in turn, could help make housing purchases more affordable and give buyers a badly needed break. Indeed, after several years of steady growth for housing sales and prices, 2019 is likely to return to a more balanced market between buyers and sellers, at least temporarily. Projections by multiple sources including the NAR, Realtor.com and Zillow are envisioning a market with home prices still rising, albeit at a slower rate of growth. As buyers wait to catch their breath, Realtor.com is also suggesting that overall sales levels could slip by about two percent, while the NAR is predicting a small gain of one percent. However, beyond the short run, these slipping or mostly flat sales levels could also exacerbate the country’s overall housing shortage even more. According to a recent study by Freddie Mac, the annual rate of U.S. construction is about 370,000 units below long-term housing demand, leading to a current pent-up shortfall of over 2.5 million homes. In many popular markets, until construction of new homes is able to increase and stabilize at higher levels, excess demand will continue to put some pressure on home prices and rents. 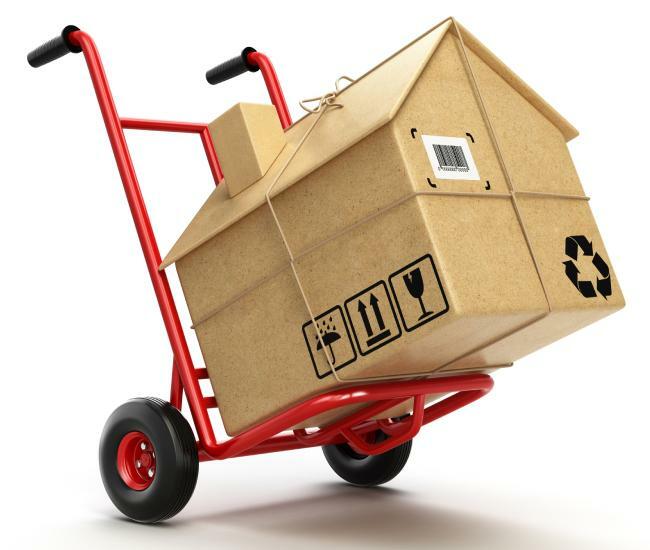 At the same time, the inventory shortage is not equally divided among housing sectors. In 2018, the NAHB modified their Leading Markets Index (LMI) to measure building permits against historical norms while adjusting for population growth. According to their new methodology, as of the third quarter of 2018, single-family permit activity, adjusted for population growth, was operating at 59 percent of potential capacity. Meanwhile, multi-family permit activity was at 98 percent of capacity. 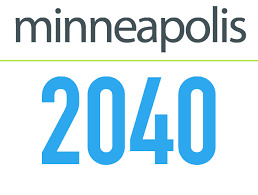 Since multi-family construction generally offers more affordable housing options, the City of Minneapolis is taking this idea one step further by rezoning single-family neighborhoods to higher densities. In early December, their City Council approved the Minneapolis 2040 plan, which will allow up to three-family homes in the city’s residential neighborhoods, remove minimum parking requirements for all new construction, and permit high-density buildings along transit corridors. The idea is to break open restrictive zoning laws in order to provide new opportunities for residents to move for schools or a job, allow aging residents to downsize without leaving their neighborhoods, slow the displacement of lower-income residents in gentrifying areas, and address the lack of affordable housing citywide. Whether or not this idea will spread to other cities, the timing is opportune. More millennial buyers are moving into their home buying years, and are expected to represent 45 percent of mortgages in 2019, with most looking to buy that first home. Gen X buyers are expected to account for another 37 percent of new mortgages, most likely trading up to the mid- to high-priced tiers, while Baby Boomers looking to relocate or downsize will capture 17 percent. Finally, another wild card to consider is the impact of the 2018 tax cut on the housing market, with overall sales levels declining soon after it passed. Although most renters will enjoy a higher standard deduction and thus lower taxes, for owners the result is less clear, as some will find lower benefits from fewer personal exemptions and itemized deductions, especially in high-tax states. If nothing else, 2019 will certainly prove to be interesting. Both personal and disposable income rose 0.5 percent in October, versus a rise of 0.6 percent for personal spending, resulting in the personal savings rate slipping to 6.2 percent. The Pending Home Sales Index decreased 2.6 percent to 102.1 in October, down from 104.8 in September. Year-over-year contract signings dropped 6.7 percent, making this the tenth straight month of annual decreases. The Fed-preferred October PCE price index increased 0.2 percent from September, and 2.0 percent year-on-year. Excluding food and energy, the PCE price index increased 0.1 percent from September and 1.8 percent year-on-year. The Market Composite Index increased 5.5 percent on a seasonally adjusted basis from one week earlier, with purchase loans up 9.0 percent and refinance activity up 1.0 percent. The average contract interest rate for 30-year fixed-rate mortgages decreased to 5.12 percent from 5.16 percent. Sales of new single-family houses in October 2018 fell 8.9 percent from September and 12.0 percent year-on-year to the lowest rate in nearly three years, or an annualized rate of 544,000 units. Meanwhile, inventory rose to 7.4 months, the highest level in 7.5 years. 54.9 in October but still well above the 50.0 no-change threshold. The US Leading Economic Index (LEI) increased slightly in October, but the pace of improvement slowed for the first time since May. Although the index still points to robust economic growth in early 2019, the rapid pace of growth noted for much of 2018 may already have peaked. The Fannie Mae Home Purchase Sentiment Index® (HPSI) decreased in October, falling 2.0 points to 85.7, continuing its recent downward trend. The decline can be attributed to decreases in five of the six components, including those measuring consumers' home buying and selling attitudes. Retail sales rebounded sharply in October, following two months of small declines. Advance estimates of U.S. retail and food services sales for October 2018 were $511.5 billion, an increase of 0.8 percent from the previous month, and 4.6 percent above October 2017. The Consumer Price Index for All Urban Consumers (CPI-U) increased 0.3 percent in October, the largest increase in nine months. Over the last 12 months, the all-items index rose 2.5 percent before seasonal adjustment. The Market Composite Index decreased 4.0 percent on a seasonally adjusted basis from one week earlier to the lowest level since December 2014, with purchase loans falling 5.0 percent and refinance activity down 3.0 percent. The average contract interest rate for 30-year fixed-rate mortgages with conforming loan balances increased to 5.15 percent from 5.11 percent. According to CoreLogic, national home prices increased 5.6 percent year over year in September 2018, and are forecast to increase 4.7 percent from September 2018 to September 2019. The September HPI gain was the slowest year-over-year gain since January 2017. An analysis of the market by price tiers indicates that lower-priced homes experienced significantly higher gains. The Producer Price Index for final demand rose 0.6 percent in October, a sharp increase from September (0.2 percent) and August (0.1 percent).On an unadjusted basis, the final demand index increased 2.9 percent for the 12 months ended in October. About this same time a year ago, I wrote about an economy which was gradually building enough strength to spark inflation, thus impacting costs for suitable land, labor and materials. Following that, the tax cuts enacted at the beginning of 2018 have certainly turbo-charged an already improving economy, resulting in robust consumer confidence, more job openings than candidates to fill them, and the lowest unemployment rate in nearly 50 years. For the housing market, however, rising interest rates, lack of inventory and high prices have definitely conspired to slow sales for both new and existing homes. U.S. GDP growth, which averaged 2.3 percent in 2017, surged to 4.2 percent by the second quarter of 2018, slipping to a still-strong advance estimate of 3.5 percent during the third quarter. Notably, it was increasing consumer spending during the third quarter which made up for a slowdown in business investment. Still, current forecasts are suggesting this rate of growth to fall below 3.0 percent during the final quarter of the year. Job growth, which rose by 250,000 in October, averaged 212,500 per month through the first ten months of 2017 (up 18.3 percent from the same period of 2017), with much of that growth noted in the fields of construction, manufacturing, health care and professional services. In addition, October’s official unemployment rate of 3.7 percent is the lowest reported since mid-1969. Not surprisingly, as of the end of September, the number of unfilled jobs was nearly 18 percent higher than the number of officially unemployed persons, which is the primary reason we’re starting to see more wage inflation of close to 3.0 percent per year. Speaking of inflation, the Federal Reserve has been keeping it mostly in check so far in 2018 with three rate hikes, and a fourth planned for December. However, given that the Producer Price Index – which tracks wholesale input prices – jumped by 0.6 percent in October (or three times what was forecast), the odds for that fourth rate hike have certainly increased. Still, the Consumer Price Index remains fairly tame, rising by 2.3 percent year-on-year through September versus 2.1 percent in 2017. Moreover, the annual increase in the Fed-preferred PCE Price Index has been trending lower since the summer months, falling to 2.0 percent by September. Consumer confidence has also helped prop up the economy in 2018, with the University of Michigan’s widely watched sentiment index remaining at its highest year-to-date level since 2000. Even stock market volatility, inflation and polarized politics have done little to dent consumer confidence, with consumers feeling flush enough to tap their savings or borrow money to fund their purchases. 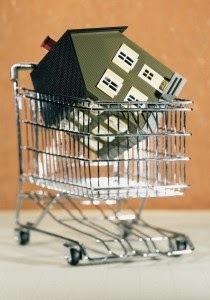 Nonetheless, a booming economy with rising inflation and home prices often takes an eventual toll on the housing market. Although builder confidence remained strong at 68 in October, building permits took a breather in September, slipping slightly from both the previous month and the same month of 2017. September housing starts also dipped moderately from August, but were up 3.7 percent year-on-year. Yet it was September’s preliminary new home sales which dropped the most, falling 13.2 percent year-on-year to the lowest level in nearly two years as the months of supply jumped to 7.1 months, the highest since March of 2011. However, since this data is regularly revised, it’s possible that new home sales have merely flattened out in line with building permits. In its own survey, the Mortgage Bankers Association showed September new home mortgage applications up 8.2 percent year-over-year, and year-to-date sales for 2018 were still up 3.1 percent versus 2017. For existing homes, a combination of low inventory for starter homes and higher interest rates helped drive down September sales down 4.1 percent year-on-year, for the lowest annual sales rate since November 2015. Unsold inventory rose slightly to a 4.4-month supply, up from 4.2 months a year ago, while the median sales price rose 4.2 percent, for the 79th straight month of year-on-year gains. Although September pending home sales did rise slightly from August, they were still down 1.0 percent year-on-year, and have fallen on an annual basis for nine consecutive months. Another indicator of affordability, the NAHB/Wells Fargo Housing Opportunity Index, fell to 56.4 percent in the third quarter of 2018, for the lowest rate since the same quarter of 2008, and down sharply from the last peak of 77.5 in 1Q 2012. Consequently, in the months ahead, look for more affordable supply and rising wages to counteract higher interest rates in order to keep the housing market humming. Information received since the Federal Open Market Committee met in September indicates that the labor market has continued to strengthen and that economic activity has been rising at a strong rate. On a 12-month basis, both overall inflation and inflation for items other than food and energy remain near 2 percent. In view of realized and expected labor market conditions and inflation, the Committee decided to maintain the target range for the federal funds rate at 2 to 2-1/4 percent. The Market Composite Index decreased 4.0 percent on a seasonally adjusted basis from one week earlier, to the lowest level since December 2014, with purchase loans down 5.0 percent and refinance activity falling 3.0 percent. The average contract interest rate for 30-year fixed-rate mortgages with conforming loan balances increased to 5.15 percent from 5.11 percent. The number of job openings decreased 3.9 percent to 7.0 million on the last business day of September. Over the month, hires fell 2.7 percent to 5.7 million, and separations fell 1.9 percent, also to 5.7 million. output and a 2.4-percent increase in hours worked. October nonfarm payroll employment rose by 250,000 -- far higher than estimates -- and the unemployment rate was unchanged at 3.7 percent. Wage gains also grew at their highest level since 2009, up 3.1 percent year-on-year. The Market Composite Index decreased 2.5 percent on a seasonally adjusted basis from one week earlier, with purchase loans falling 2.0 percent and refinance activity down 4.0 percent. The average contract interest rate for 30-year fixed-rate mortgages remained unchanged at 5.11 percent. Private-sector employment increased by 227,000 in October, on a seasonally adjusted basis. This growth rate compares with 218,000 in September and 161,000 in October of 2017. U.S.-based employers announced plans to cut 75,644 jobs from their payrolls in October, up 36.8 percent from September and 153.6 percent higher year-on-year, although 58.2 percent of these cuts were for a single employer, Verizon. October job cuts are the highest since July 2015, when 105,696 cuts were announced, but YTD job cuts are still up just 5.5 percent from 2017. Construction spending was flat in September following an upwardly revised 0.8 percent jump in August (up from 0.1 percent). Construction spending increased 7.2 percent on a year-on-year basis. Mortgage applications for new home purchases decreased 4.6 percent compared to August 2017. Compared to July 2018, applications decreased by two percent. The Conference Board Leading Economic Index® (LEI) for the U.S. increased 0.4 percent in August to 111.2 (2016 = 100), following a 0.7 percent increase in July, and a 0.5 percent increase in June. The leading economic index is now well above its previous peak (March 2006, 102.4). Existing-home sales remained steady in August at 5.34 million units per year after four straight months of decline. Sales were still down 1.5 percent year-on-year. Bloomberg: Consumer comfort advanced last week to a fresh 17-year high of 60.2 on brighter views of the economy. In addition, the gauge tracking views of economy also rose to a new a 17-year high, climbing to 64.3 from 62.0. The measure of buying climate climbed to 52.5, highest since September 2000, and the monthly economic expectations index rose to 57.5 in September, the highest since March 2002. Join us for the 2018 Inland Empire Economic Forecast on 10/11/18! MetroIntelligence is pleased to be a sponsor for the 2018 Inland Empire Economic Forecast taking place on Thursday, October 11th in Riverside, CA. It's been a decade since the U.S. fell into the worst economic downturn of the modern age. The Great Recession was especially ‘great’ in the Inland Empire where the damage inflicted was among the worst in the nation and came at a time of unprecedented expansion locally. Today, propelled by one of the fastest growing populations in the state, the region has largely put this painful episode behind it as unemployment has fallen to record-low levels, incomes are rising, and the housing market is picking up ever greater steam. Is the Inland Empire economy different today than when the Great Recession hit? Are we better prepared to face the next downturn? Are the same conditions that led to the recession beginning to form again? What signals should we watch for? What are the greatest threats to today’s prosperity? What are the best opportunities and how can you take advantage of them? Builder confidence remained steady at 67 in September on the NAHB's Housing Market Index. Current sales conditions rose one point to 74, six-month expectations increased two points to 74, and buyer traffic remained unchanged at 49. Privately-owned housing units authorized by building permits in August were at a seasonally adjusted annual rate of 1,229,000. This is 5.7 percent below the revised July rate of 1,303,000 and is 5.5 percent below the August 2017 rate of 1,300,000. Privately-owned housing starts in August were at a seasonally adjusted annual rate of 1,282,000. This is 9.2 percent above the revised July estimate of 1,174,000 and is 9.4 percent above the August 2017 rate of 1,172,000. July business inventories increased 0.6 percent after edging up 0.1 percent in June and boosted by a strong increase in the stock of motor vehicles. Year-on-year inventories rose 4.3 percent. 78.1 percent, a rate that is 1.7 percentage points below its long-run (1972-2017) average. Consumer sentiment rose strongly in an early September read to 100.8, the second-highest level since 2004, and only behind the March 2018 reading of 101.4. These gains were also widespread across all major socioeconomic subgroups. Retail sales edged up 0.1 percent in August, the smallest rise since February. Still, data for July was revised higher to show sales rising 0.7 percent instead of the previously reported 0.5 percent gain. 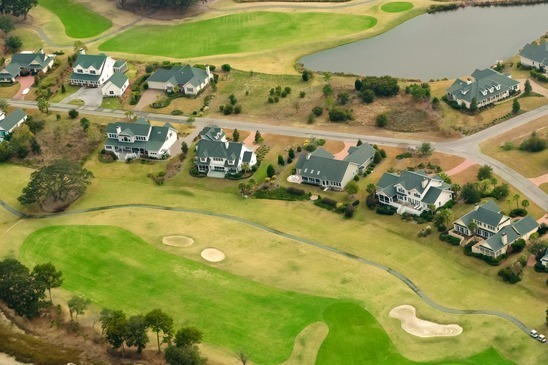 It wasn’t too long ago when the typical master-planned community was mostly a collection of separate subdivisions selling under a shared branded location, with some homes wrapped around a golf course or a water feature in order to offer views (and premiums). If there was a retail component, it was generally located on the periphery, requiring residents on various cul-de-sacs to drive for even the shortest errand. When people went out for walks, it was generally along paved sidewalks adjacent to neighborhood streets, and did little to encourage interaction among the residents. 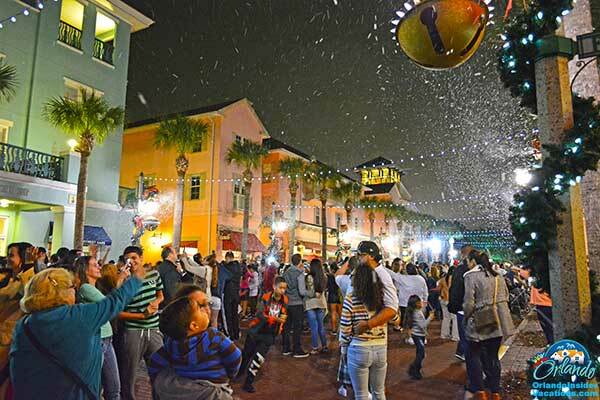 Today, however, the typical master-planned community developer has replaced the golf course with open space and trails, created nostalgic town centers within walking distance of each home, and started producing regular events in order to foster more interaction among those who live there. Somewhat ironically, it was the Great Recession, the housing bust and recovery which allowed many developers the luxury of time to re-think what a modern master-planned community could be. This time period also coincided with the aging of the millennial generation into their household-forming years, with many of them opting for novel and creative experiences, versus simply demanding more living space and a higher bedroom count. Consequently, today’s most successful master plans focus on promoting a unique sense of place, with the actual living space sometimes almost viewed as a secondary consideration. Another major change was greater product segmentation, with a few traditional single-family subdivisions of various home and lot sizes giving way to higher-density, single-family and multi-family options, both for younger residents as well as downsizing seniors wanting to live close to family and friends. In some cases, today’s build-to-rent homes will eventually be converted for sale at the appropriate time, thus encouraging new renters to start developing local roots now instead of later. Yet when bumping up against unyielding costs for land and improvements, developing an experiential community with ample open space alongside a wide mix of products creates its own mix of challenges to the bottom line. 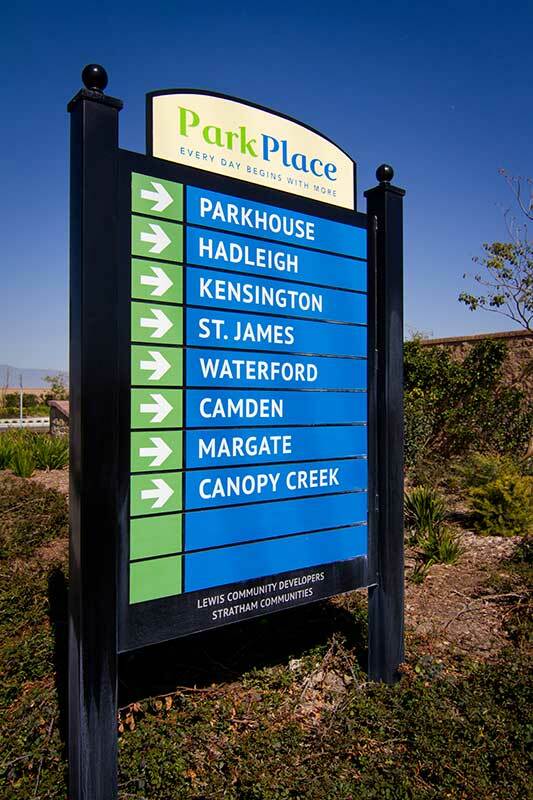 In some cases, good place making can incorporate a common theme to be used throughout the community. 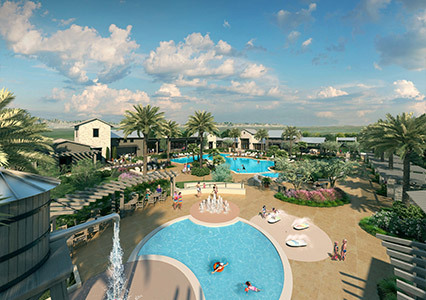 At the 199-acre Sterling Meadows master plan near Sacramento, CA, developer The True Life Companies chose music as a connector, especially at its 13.7-acre main park. In addition to interior pathways designed to resemble a treble cleft (essential to reading music), musical notes and symbols are inlaid into the pavement on pathways, in plazas and in water play areas. Even the community’s street names are tied to music, with the exception of one key street, which is named for a fallen military veteran of the local community. In other cases, ensuring that the community blends into the surrounding environment is critical. At the 1,600-acre Tesoro Viejo master plan north of Fresno, CA, views of the nearby Sierra Nevada foothills are given center stage, with one-quarter of the land allocated for natural open space, parks, areas for recreation and miles of trails. 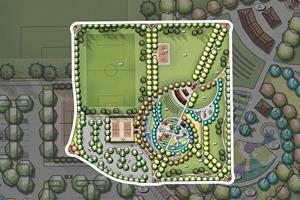 For community interaction, a resort-style clubhouse, amphitheater and large event lawn will be able to host a variety of live events. The tradition-oriented Town Center, modeled after a typical small town’s Main Street, will include new stations for fire and police protection as well as the Welcome Center. Dubbed “The Hub,” the center will include a neighborhood coffee bar, food options and multi-use offices for daily use long after the last home has sold. For more built-out environments, the challenge is how to transform a large swath of land which will still appear relatively seamless when completed. 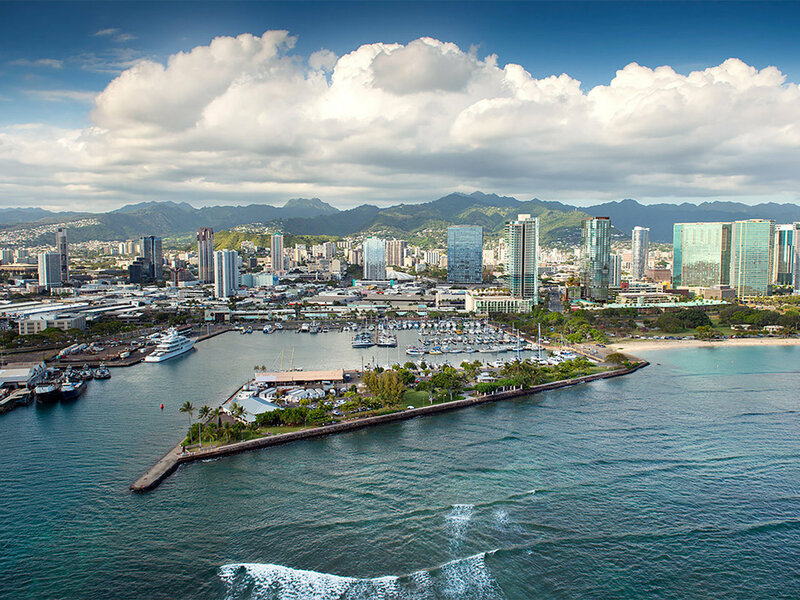 In between the downtown area and a 30-acre harbor in Honolulu, HI, Howard Hughes Corp. is re-envisioning a former center for heavy industry and commercial fishing into the environmentally friendly Ward Village. Here, cars are given a lesser priority than pedestrians, bikes and buses, encouraging a slower pace of life. When completed, a central plaza with a Farmer’s Market, a future light rail stop, 4,000 residential units and over one million square feet of retail and commercial space – including scores of existing businesses – will allow locals to visit some of their long-favorite haunts in a re-envisioned place. Others will simply call it home. Firms' inflation expectations were virtually unchanged at 2.2 percent over the year ahead during the September survey. Sales levels compared to "normal times" declined somewhat over the month. Profit margins declined as well, and year-over-year unit costs went unchanged at 2.0 percent, on average. Total consumer credit rose in July to a seasonally adjusted $3.91 trillion, for an annual growth rate of 5.1 percent. Revolving credit, such as credit cards, rose only 1.5 percent per annum. Nonrevolving credit, typically auto and student loans, jumped 6.4 percent per annum. The NFIB Small Business Optimism Index soared to 108.8 in August, a new record in the survey's 45-year history, topping the July 1983 highwater mark of 108. The record-breaking figure is driven by small business owners executing on the plans they've put in place due to "dramatic changes in the nation's economic policy." More workers quit their jobs in July since January 2001, rising to 3.6 million, or 2.4 percent of the nonfarm workforce. The number of positions waiting to be filled rose to 6.94 million, or 4.4 percent of the workforce, both of which are the highest figures since this series launched in December 2000. Layoffs declined slightly to 1.65 million, or 1.1 percent of the workforce. The Producer Price Index for final demand, seasonally adjusted, declined 0.1 percent in August after no change in July. On an unadjusted basis, the final demand index rose 2.8 percent for the 12 months ended in August. The MNI Chicago Business Barometer slipped to a three-month low of 63.6 in August, down 1.9 points from July's 65.5. A softening in Supplier Deliveries, Order Backlogs and Employment offset gains in Production and New Orders, driving the decline in the Barometer. However, it still sits 6.9% higher on the year and continues to signal robust business conditions. Although there was a small uptick in late August, consumer sentiment remained at its lowest level since January. Most of the August decline was in the Current Economic Conditions Index, which fell to its lowest level since November 2016. These results stand in sharp contrast to the recent very favorable report on growth in the national economy. Led by slower growth in production-related indicators, the Chicago Fed National Activity Index (CFNAI) declined to +0.13 in July from +0.48 in June. The index's three-month moving average, CFNAI-MA3, moved down to +0.05 in July from +0.20 in June. 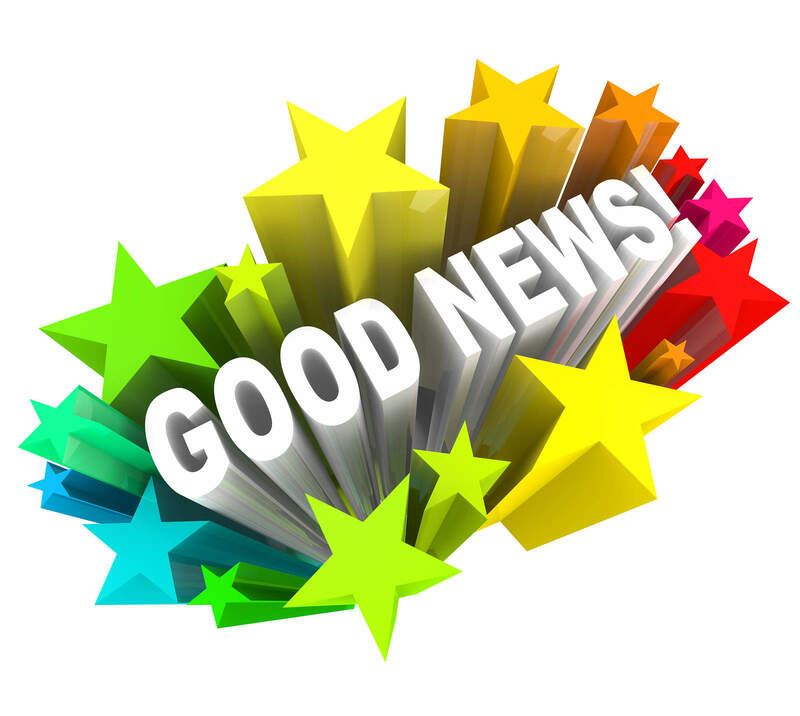 According to the Mortgage Bankers Association's (MBA) Quarterly Survey of Commercial/Multifamily Mortgage Bankers Originations, second quarter 2018 commercial and multifamily mortgage loan originations were four percent higher than during the same period last year and 32 percent higher than the first quarter of 2018. U.S. central bankers discussed raising interest rates soon to counter excessive economic strength but also examined how global trade disputes could batter businesses and households. U.S. house prices rose 1.1 percent in the second quarter of 2018 and 6.5 percent from the second quarter of 2017 to the second quarter of 2018. FHFA's seasonally adjusted monthly index for June was up 0.2 percent from May. Sales of new single-family houses in July 2018 were at a seasonally adjusted annual rate of 627,000, the lowest rate in nine months. This is 1.7 percent below the revised June rate of 638,000, but is 12.8 percent above the July 2017 estimate of 556,000. The Market Composite Index increased 4.2 percent on a seasonally adjusted basis from one week earlier, with purchase loans rising 3.0 percent and refinance activity up 6.0 percent. The average contract interest rate for 30-year fixed-rate mortgages remained unchanged from 4.81 percent. Online retail sales grew 3.7 faster than overall retail sales for the year ending in 2Q 2018. During the previous year, online retail sales rose by 15.5 percent versus 4.2 percent for all retail sales. The share of retail sales rose to 9.6 percent in 2Q 2018, up from 8.8 percent year-on-year. The U.S. LEI increased in July, suggesting the US economy will continue expanding at a solid pace for the remainder of this year. The strengths among the components of the leading index were very widespread, with unemployment claims, the financial components, and the ISM® New Orders Index making the largest positive contributions. Privately-owned housing starts in July were at a seasonally adjusted annual rate of 1,168,000. This is 0.9 percent above the revised June estimate of 1,158,000, but is 1.4 percent below the July 2017 rate of 1,185,000. In the week ending August 11, initial unemployment claims were 212,000, a decrease of 2,000 from the previous week's revised level. 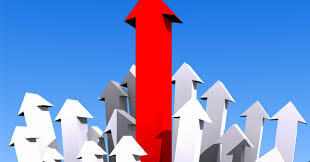 The 4-week moving average was 215,500, an increase of 1,000 from the previous week's revised average. Industrial production edged up 0.1 percent in July after rising at an average pace of 0.5 percent over the previous five months. At 108.0 percent of its 2012 average, total industrial production was 4.2 percent higher in July than it was a year earlier. Privately-owned housing units authorized by building permits in July were at a seasonally adjusted annual rate of 1,311,000. This is 1.5 percent above the revised June rate of 1,292,000 and is 4.2 percent above the July 2017 rate of 1,258,000. The Market Composite Index decreased 2.0 percent on a seasonally adjusted basis from one week earlier, with purchase loans down 30 percent and refinance activity remaining flat. The average contract interest rate for 30-year fixed-rate mortgages decreased to 4.81 percent from 4.84 percent. Firms' inflation expectations went unchanged at 2.1 percent over the year ahead. Current economic environment: Sales levels remain "about normal," on average. Profit margins improved somewhat, and year-over-year unit costs increased somewhat to 2.0 percent, on average. U.S. retail sales rose a healthy 0.5% in July, although June's sales were reduced from a 0.5% to a 0.2% gain. Retail sales rose 0.6% minus gas stations and auto dealers. Over the last year, retail sales have increased 6.4%, close to the long-run average since 1980. Nonfarm business sector labor productivity increased 2.9 percent during the second quarter of 2018, as output increased 4.8 percent and hours worked increased 1.9 percent. From the second quarter of 2017 to the second quarter of 2018, productivity increased 1.3 percent, reflecting a 3.5-percent increase in output and a 2.2-percent increase in hours worked. Builder confidence in the market for newly-built single-family homes edged down one point to a solid 67 reading in August on the National Association of Home Builders/Wells Fargo Housing Market Index (HMI). The HMI index measuring current sales conditions inched one point lower to 73 while the component gauging expectations in the next six months all fell a single point to 72. Meanwhile, the metric charting buyer traffic dropped two points to 49. Total household debt increased by $82 billion (0.6%) to $13.29 trillion in the second quarter of 2018. It was the 16th consecutive quarter with an increase, and the total is now $618 billion higher than the previous peak of $12.68 trillion, from the third quarter of 2008. Further, overall household debt is now 19.2% above the post-financial-crisis trough reached during the second quarter of 2013. While overall delinquency rates have remained stable at relatively low levels, transition rates into delinquency have fallen noticeably for student debt over the past year, reflecting an improved labor market and increased participation in various income-driven repayment plans. The Small Business Optimism Index marked its second highest level in the survey’s 45-year history at 107.9, rising to within 0.1 point of the July 1983 record-high of 108. The July 2018 report also set new records in terms of owners reporting job creation plans and those with job openings. A seasonally adjusted net 23 percent are planning to create new jobs, up three points from June. Thirty-seven percent of all owners reported job openings they could not fill in the current period, a one-point increase from June. Consumer sentiment slipped to its lowest level since last September, with the decline concentrated among households in the bottom third of the income distribution. The dominating weakness reflected much less favorable assessments of buying conditions, mainly due to less favorable perceptions of market prices. These are extraordinary shifts in price perceptions given that consumers anticipate an inflation rate in the year ahead of 2.9% in early August, unchanged from last month. The data suggest that consumers have become much more sensitive to even relatively low inflation rates than in past decades. Overall, the data indicate that consumers have little tolerance for overshooting inflation targets, and to the benefit of the Fed, interest rates now play a more decisive role in purchase decisions. Second Quarter 2018 Economic Update: The Strongest Growth since 2014, But Will it Last? It was certainly good news to hear that the initial estimate for GDP growth of 4.1 percent in the second quarter of 2018 was the fastest since the third quarter of 2014. This recent rate of growth compares to 2.2 percent in the first quarter of 2018, 2.3 percent in 2017 and 1.5 percent in 2016. As of early August, GDPNow was also forecasting third quarter growth of 4.3 percent, although both these GDP estimates and forecasts are likely to change as more information comes in. Most of the surge noted during the second quarter was due to a boost in consumer spending (along with the highest levels of consumer confidence in years), exports, nonresidential fixed investment (including commercial real estate, factories and machinery) and government spending. It would have been even higher were it not for declines in private inventory investment by businesses and residential fixed investment (including home building and remodeling). One political factor weighing heavily on the boost in growth was the export of goods, with its rise quadrupling from the first quarter to 13.3 percent, as numerous countries stocked up in advance in order to avoid real and potential retaliatory tariffs. This export surge itself was responsible for about one full point of the 4.1-percent GDP increase. At the same time, the rate of import growth fell sharply to just 0.5 percent, indicating that domestic suppliers either had adequate inventories or capacity to meet demand. Another political factor was the tax cuts enacted at the beginning of 2018, which boosted consumer spending after a lag in the first quarter, and led to large corporations buying hundreds of billions of their own shares, thus helping to support the stock market. A healthy stock market, in turn, improves both 401k balances as well as consumer confidence. What we don’t know yet is if the export surge or the boost in consumer spending is sustainable, but we’ll find that out through the rest of the year. For now, the job market remains tight, with July unemployment dipping back to 3.9 percent along with 157,000 new positions. Looking at just the second quarter of 2018 alone, job growth rose by over 21 percent versus the same quarter of 2017. Moreover, for the first seven months of 2018, job growth increased by over 16 percent versus 2017. Wages, which had remained stubbornly flat throughout much of the economic recovery, surged during the second quarter of 2018 by 2.8 percent over the previous year, for the sharpest increase since the third quarter of 2008. Still, with inflation slowly on the rise, most of these wage gains are being eaten up by higher costs for energy, transportation and shelter. 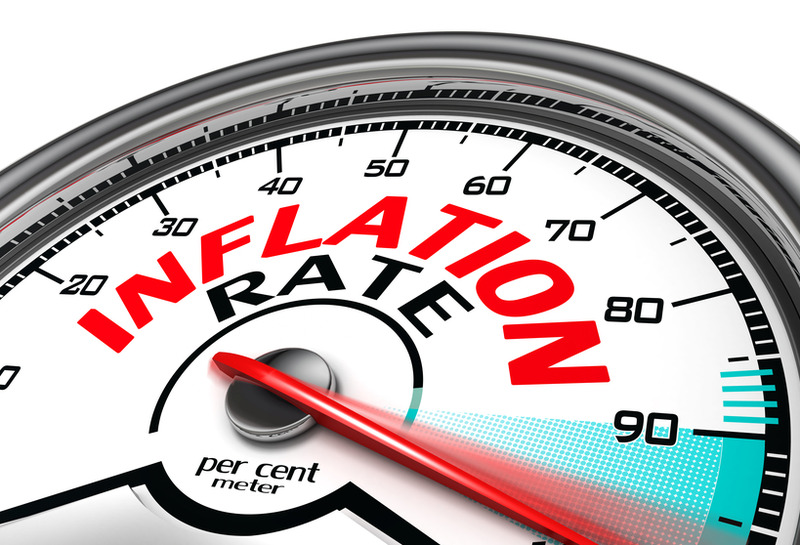 Annual core inflation readings from the CPI, PPI and PCE Price Index have recently ranged from 1.9 to 2.8 percent versus the Fed’s preferred increase of 2.0 percent. It’s for that reason that we’re likely to see a total of four interest rate increases by the Fed this year, and up to three more in 2019. For the housing market, although home builders continue to push forward on meeting demand, they’re up against several headwinds including higher mortgage rates (up 18 percent annually through the first week of August), higher building costs (especially tariffs on Canadian timber) and ongoing difficulties locating suitable land and labor. Although average monthly housing starts and building permits did fall by a small amount between the first and second quarters of 2018, they were still up moderately for the first half of the year versus 2017. New single-family home sales, which averaged an annual rate of 646,000 in the second quarter of 2018, were also up 6.4 percent for the first half of the 2018 versus 2017. The pricing premium for new versus existing homes, which approached 40 percent as recently as the end of 2017, steadily fell to just nine percent by June of 2018, thus making a new home much more competitive. In fact, forecasters are pointing to the new home market to drive the housing market in the near term, as the existing home market remains penned in by low inventory, increasing affordability issues and higher interest rates. Still, with the backlog of unsold new single-family homes rising to 5.7 months in June, some builders are also facing similar affordability challenges with their buyers. In the long run, however, given the huge pent-up demand for housing in the U.S., only the most serious shocks to the economy are likely to derail the long and slow recovery. The July CPI rose 2.9% year-on-year, largely due to energy (+12.1%), transport (+4.0%) and shelter (+3.5%). The 'core' index rose 2.4% year-on-year, for the highest increase in nearly 10 years. the previous week's revised average. The Market Composite Index decreased 3.0 percent on a seasonally adjusted basis from one week earlier to its lowest level since January 2016, with purchase loans falling 2.0 percent and refinance activity down 5.0 percent. The average contract interest rate for 30-year fixed-rate mortgages with conforming loan balances remained unchanged at 4.84 percent. U.S. consumer sentiment advanced to a 17-year high of 59.3, elevated by rosier views of the economy and personal finances. This is the highest level noted since February 2001. June 2018 sales of merchant wholesalers were down 0.1 percent from May but up 10.2 percent year-on-year. Inventories were up 0.1 percent from May and 5.1 percent year-on-year. The Producer Price Index for final demand was unchanged in July, seasonally adjusted, and rose 3.3 percent year-on-year. The index for final demand less foods, energy, and trade services moved up 0.3 percent in July, and was up 2.8 percent year-on-year. Consumer borrowing slowed in June after hitting a six-month high in the prior month, but still rose at an annual rate of 3.1 percent. Revolving credit, including credit cards, declined by 0.2% in June after rising 11.2% in May. This is the second drop in credit-card use in the past four months. Nonrevolving credit, including auto and student loans, rose 4.4% in June, and has been rising at a relatively steady pace in recent months. annual rate of 637,000 units in July 2018, up 8.5 percent from June. The Conference Board Employment Trends Index™ (ETI) increased in July, after increasing in June. The index now stands at 109.89, up from 108.72 in June. The change represents a 5.4 percent gain in the ETI compared to a year ago. 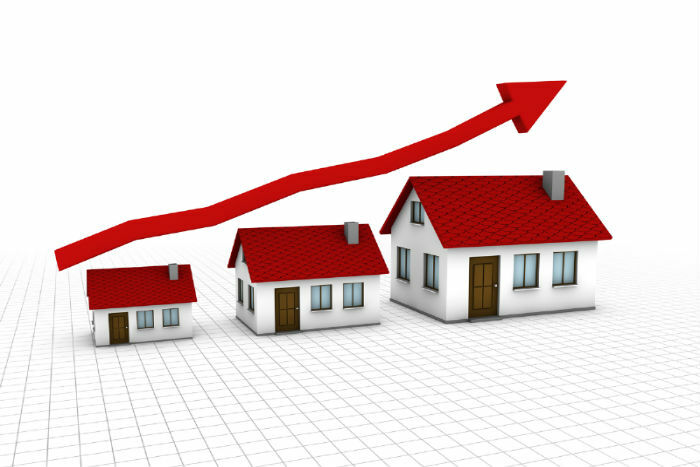 CoregLogic: June home prices increased nationally by 0.7 percent from May and 6.8 percent year over year. Looking ahead, the CoreLogic HPI Forecast indicates that the national home-price index is projected to continue to increase by 5.1 percent over the next year. Although overall job openings were nearly flat between the final days of May and June (rising by 0.5 percent to 6.7 million), hires fell 1.67 percent while separations rose 1.53 percent. With 6.6 million unemployed persons in June (falling to 6.3 million in July), there still likely remains a surplus of open positions. The NMI® registered 55.7 percent in July, which is 3.4 percentage points lower than the June reading of 59.1 percent. There has been a ‘cooling off’ in growth for the non-manufacturing sector, and tariffs and deliveries are an ongoing concern. Still, the majority of respondents remain positive about business conditions and the economy. The nation’s international trade deficit in goods and services increased to $46.3 billion in June from $43.2 billion in May, as exports decreased and imports increased. Online advertised vacancies increased by 170,800 to 4,651,500 in July, nearly erasing the loss of 171,633 noted for June. In July of 2017, the number of online job vacancies declined by 146,067. Total nonfarm payroll employment rose by 157,000 in July, and the unemployment rate edged down to 3.9 percent. This growth rate compares with 248,000 in June and 190,000 in July of 2017. Employment increased in professional and business services, in manufacturing, and in health care and social assistance. In the week ending July 28, initial unemployment claims were 218,000, an increase of 1,000 from the previous week's unrevised level of 217,000. The 4-week moving average was 214,500, a decrease of 3,500 from the previous week's unrevised average of 218,000. Bloomberg: The weekly Consumer Comfort Index eased to 58.6 from a 17-year high 59 in previous week as the gender gap widened to 18.6 points in favor of men, up from 16.5 points in prior week. This is the highest gap since 1990.
slowdown was likely in the third quarter. U.S.-based employers announced plans to cut 27,122 workers from payrolls during July, down both 27.1 percent from June and 4.2 percent year-on-year. Although July's total was the lowest of the year, YTD job cuts are still up 6.7 percent from 2017. Still, nearly 90 percent of companies polled are in hiring or retention mode. The July PMI® registered 58.1 percent, a decrease of 2.1 percentage points from the June reading of 60.2 percent. Production and employment continues to expand in spite of labor and material shortages. Inputs — expressed as supplier deliveries, inventories and imports — had expansion increases, due primarily to negative supply chain issues, but at easing levels compared to the prior month. Price pressure remains strong, but the index softened for the second straight month. Demand remains robust, but the nation’s employment resources and supply chains continue to struggle. Respondents are again overwhelmingly concerned about how tariff-related activity, including reciprocal tariffs, will continue to affect their business. The Market Composite Index decreased 2.6 percent on a seasonally adjusted basis from one week earlier, with purchase loans falling 3.0 percent and refinances down 2.0 percent. The average contract interest rate for 30-year fixed-rate mortgages increased to 4.84 percent from 4.77 percent. As expected, the Fed opted to keep interest rates unchanged for now, but warns of future rate hikes to come in 2018, perhaps as soon as September. Private-sector employment increased by 219,000 from June to July, on a seasonally adjusted basis. This compares to 181,000 in June and 203,000 in July of 2017. Construction spending fell 1.1 percent in June, the largest decline since April 2017. However, data for May was revised up to show construction outlays rising 1.3 percent instead of the previously reported 0.4 percent gain, and April's outlays increased 1.7 percent instead of the previously estimated 0.9 percent. The MNI Chicago Business Barometer rose to a six-month high of 65.5 in July, up 1.4 points from 64.1 in June, with the prices paid index rising to a 10-year high. Consumer confidence gained marginal ground by rising 0.3 points in July, after a modest decline in June. Consumers' assessment of present-day conditions improved, suggesting that economic growth is still strong. However, while expectations continue to reflect optimism in the short-term economic outlook, back-to-back declines suggest consumers do not foresee growth accelerating. In June, personal income, disposable personal income and personal consumption expenditures all increased 0.4 percent. The personal savings rate was unchanged from May at 6.8 percent. Compensation costs for civilian workers increased 0.6 percent, seasonally adjusted, for the 3-month period ending in June 2018. Wages and salaries increased 0.5 percent and benefit costs increased 0.9 percent. Year-on-year, compensation costs rose 2.8 percent, with wages and salaries up 2.8 percent and benefits rising 2.9 percent. 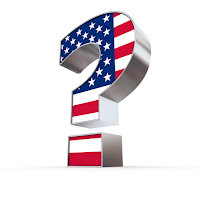 The S&P CoreLogic Case-Shiller U.S. National Home Price NSA Index, covering all nine U.S. census divisions, reported a 6.4% annual gain in May, remaining the same as in the previous month. Before seasonal adjustment, the National Index posted a month-over-month gain of 1.1% in May. In June, the PCE price index increased 0.1 percent. Excluding food and energy, the PCE price index increased 0.1 percent. Year-on-year, the PCE price Index rose 2.2 percent. Excluding food and energy, the index rose 1.9 percent. The Global Investor Confidence Index increased to 101.8 in July, up 1.0 point from June's revised reading of 100.8. It is possible that the prospects of escalating trade protectionism, political uncertainty, and lagging earnings growth continue to depress institutional investor sentiment. According to a Gallup poll, 37 percent of respondents cited the economy or jobs as nation's biggest positive factor. This marks a 14-year high in Gallup's monthly poll series. 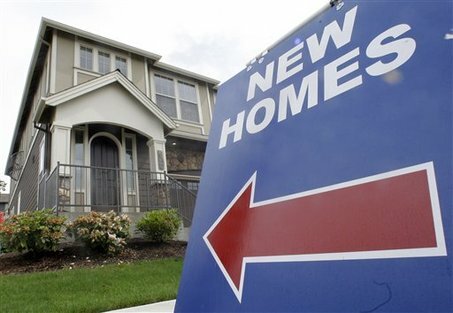 The Pending Home Sales Index rose 0.9 percent to 106.9 in June from 105.9 in May. Despite last month's increase, contract signings are still down 2.5 percent on an annual basis. Consumer sentiment posted a trivial 0.3 point one-month decline in July, remaining a half of an Index-point or less from the average in the prior twelve months (97.7) or since the start of 2017 (97.4). Despite the expectation of higher inflation and higher interest rates during the year ahead, consumers have kept their confidence at high levels due to favorable job and income prospects. U.S. GDP grew by 4.1 percent in the second quarter of 2018 in the first of three estimates. Most of this jump from the 2.2 percent rate noted in the first quarter was from personal spending, exports, nonresidential fixed investment, federal government spending, and state and local government spending. In the week ending July 21, initial unemployment claims were 217,000, an increase of 9,000 from the previous week's revised level. The 4-week moving average was 218,000, a decrease of 2,750 from the previous week's revised average. The Market Composite Index decreased 0.2 percent on a seasonally adjusted basis from one week earlier, with purchase loans down 1.0 percent but refinances up 1.0 percent. 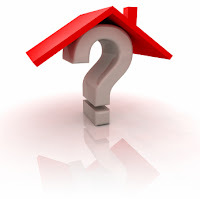 The average contract interest rate for 30-year fixed-rate mortgages remained unchanged at 4.77 percent. Americans' confidence rose to the highest level since February 2001 on brighter assessments of the economy, with the Bloomberg Consumer Comfort Index rising for the seventh straight week to 59.0 from 58.8. The international trade deficit was $68.3 billion in June, up 5.5 percent from $64.8 billion in May. Exports of goods for June were $141.9 billion, $2.2 billion less than May exports. Imports of goods for June were $210.3 billion, $1.3 billion more than May imports. Overall orders for durable goods, items meant to last three years or more, increased 1.0 percent in June as demand for transportation equipment rebounded. Excluding transportation, orders rose 1.5 percent. Net foreign direct investment in the U.S. was $53.1 billion in 1Q 2018, the first quarter in which the tax cuts took effect. This level of investment is down 43% from the same quarter of 2017 and 37% from the fourth quarter of 2017. Sales of new single-family houses in June 2018 were at a seasonally adjusted annual rate of 631,000, the lowest rate in eight months and down 5.3 percent from May. Still, sales were up 2.4 percent year-on-year. The median new house price fell 4.2 percent to $302,100 in June from a year ago. 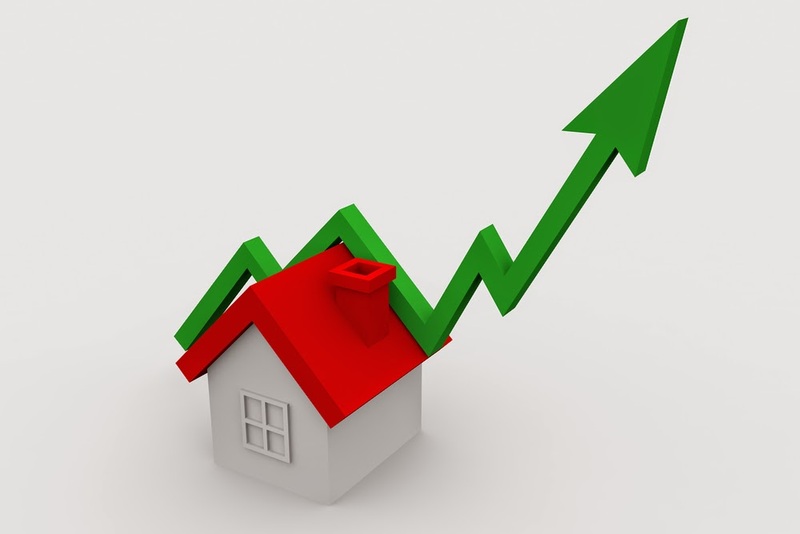 The FHFA House Price Index (HPI) reported a 0.2 percent increase in U.S. house prices in May from April. From May 2017 to May 2018, house prices were up 6.4 percent. U.S. private sector companies experienced a robust rise in overall business activity during July, supported by an improving economic backdrop and another sharp upturn in incoming new work. Relatively strong rates of business activity growth were recorded in both the manufacturing and service sectors. Intense cost pressures continued in July, which resulted in a sharp and accelerated increase in average prices charged by private sector firms. The latest rise in output charges was the fastest since composite data were first collected in October 2009. Led by improvements in production-related indicators, the Chicago Fed National Activity Index (CFNAI) rebounded to +0.43 in June from –0.45 in May. The index’s three-month moving average, CFNAI-MA3, edged up to +0.16 in June from +0.10 in May. Existing-home sales decreased for the third straight month in June, falling by 0.6 percent from May and down 2.2 percent year-on-year. The ongoing supply and demand imbalance helped push June’s median sales price to a new all-time high of $276,900, up 5.2 percent year-on-year. In the week ending July 14, initial unemployment claims were 207,000, a decrease of 8,000 from the previous week's revised level. This is the lowest level for initial claims since December 6, 1969 when it was 202,000. The 4-week moving average was 220,500, a decrease of 2,750 from the previous week's revised average. The Market Composite Index decreased 2.5 percent on a seasonally adjusted basis from one week earlier, with purchase loans falling 5.0 percent but refinances rising 2.0 percent. The average contract interest rate for 30-year fixed-rate mortgages increased to 4.77 percent from 4.76 percent. The U.S. LEI increased in June by 0.5 percent to 109.8 after being flat in May, pointing to continuing solid growth in the U.S. economy. The widespread growth in leading indicators, with the exception of housing permits which declined once again, does not suggest any considerable growth slowdown in the short-term. Industrial production rose 0.6 percent in June after declining 0.5 percent in May. For the second quarter as a whole, industrial production advanced at an annual rate of 6.0 percent, its third consecutive quarterly increase. At 107.7 percent of its 2012 average, total industrial production was 3.8 percent higher in June than it was a year earlier. Privately-owned housing units authorized by building permits in June dipped for the third month to a seasonally adjusted annual rate of 1,273,000, which is the lowest rate since September 2017. This is also 2.2 percent below the revised May rate of 1,301,000 and is 3.0 percent below the June 2017 rate of 1,312,000. Privately-owned housing starts in June were at a seasonally adjusted annual rate of 1,173,000, dipping to the lowest rate since September 2017. This is 12.3 also below the revised May estimate of 1,337,000 and is 4.2 percent below the June 2017 rate of 1,225,000. June mortgage applications for new home purchases decreased 12 percent since May and were down 8.8 percent year-on-year, but are not seasonally adjusted. For the first six months of 2018, however, new home applications rose 2.5 percent year-on-year. Economic activity continued to expand across the United States, with 10 of the 12 Federal Reserve Districts reporting moderate or modest growth. The outliers were the Dallas District, which reported strong growth driven in part by the energy sector, and the St. Louis District where growth was described as slight. Manufacturers in all Districts expressed concern about tariffs and in many Districts reported higher prices and supply disruptions that they attributed to the new trade policies. All Districts reported that labor markets were tight and many said that the inability to find workers constrained growth. Consumer spending was up in all Districts with particular strength in Dallas and Richmond. Contacts reported higher input prices and shrinking margins. Six Districts specifically mentioned trucking capacity as an issue and attributed it to a shortage of commercial drivers. Contacts in several Districts reported slow growth in existing home sales but were not overly concerned about rising interest rates. Commercial real estate was largely unchanged. Industrial production rose 0.6 percent in June after declining 0.5 percent in May. For the second quarter as a whole, industrial production advanced at an annual rate of 6.0 percent, its third consecutive quarterly increase. At 107.7 percent of its 2012 average, total industrial production was 3.8 percent higher in June than it was a year earlier. Capacity utilization for the industrial sector increased 0.3 percentage point in June to 78.0 percent, a rate that is 1.8 percentage points below its long-run (1972–2017) average. Builder confidence in the market for newly-built single-family homes remained unchanged at a solid 68 reading in July on the National Association of Home Builders/Wells Fargo Housing Market Index (HMI). The HMI index measuring current sales conditions remained unchanged at 74. Meanwhile, the component gauging expectations in the next six months dropped two points to 73 and the metric charting buyer traffic rose two points to 52. Builder confidence in the market for newly-built single-family homes remained unchanged at a solid 68 reading in July on the National Association of Home Builders/Wells Fargo Housing Market Index (HMI). The HMI index measuring current sales conditions remained unchanged at 74. Meanwhile, the component gauging expectations in the next six months dropped two points to 73 and the metric charting buyer traffic rose two points to 52. Looking at the three-month moving averages for regional HMI scores, the Northeast rose one point to 57 while the Midwest remained unchanged at 65. The West and South each fell one point to 75 and 70, respectively. The headline general business conditions index edged down by over two points to 22.6—still a high level, suggesting a continuation of robust growth. Looking ahead, firms were slightly less optimistic about the six-month outlook than they were last month. Retail sales increased 0.5 percent in June, for the largest gain since September 2017, and were up 6.6 percent year-on-year. Total sales for the April 2018 through June 2018 period were up 5.9 percent from the same period a year ago. Consumer sentiment slipped in early July but remained nearly equal to the average in the prior twelve months (97.7) and since the start of 2017 (97.4). So far, the strength in jobs and incomes has overcome higher inflation and interest rates. The darkening cloud on the horizon, however, is due to rising concerns about the potential negative impact of tariffs on the domestic economy. While consumers may not understand the intricacies of trade theory, they have substantial experience making decisions about the timing of discretionary purchases based on prospective trends in prices. In the week ending July 7, initial unemployment claims were 214,000, a decrease of 18,000 from the previous week's revised level. The 4-week moving average was 223,000, a decrease of 1,750 from the previous week's revised average. The Market Composite Index increased 2.5 percent on a seasonally adjusted basis from one week earlier, with purchase loans rising 7.0 percent but refinance activity falling 4.0 percent. The average contract interest rate for 30-year fixed-rate mortgages decreased to 4.76 percent. The Consumer Comfort Index improved for a fifth straight week, buoyed by brighter views of their personal finances and record-high confidence among Republicans. The index rose from 57.6 to 58.0, the highest reading since mid-April and matching the second-strongest reading since February 2001. The Consumer Price Index for All Urban Consumers (CPI-U) increased 0.1 percent in June and was up 2.9 percent year-on-year. The index for all items less food and energy rose 0.2 percent in June, and was up 2.3 percent year-on-year. Firms' inflation expectations went unchanged at 2.1 percent over the year ahead. Sales levels remain "about normal," on average. Profit margins improved somewhat, and year-over-year unit costs decreased somewhat to 1.9 percent, on average. U.S. wholesale inventories were a bit higher than initially estimated in May, rising by 0.6 percent amid strong increases in the stocks of machinery and a range of other goods. Economists expect the pace of inventory accumulation to pick up slightly in the second quarter after weak domestic demand in the first quarter. The Producer Price Index for final demand rose 0.3 percent in June, down from 0.5 percent in May but up from 0.1 percent in April. On an unadjusted basis, the final demand index moved up 3.4 percent for the 12 months ended in June, the largest 12-month increase since climbing 3.7 percent in November 2011. My column for the July edition of Builder & Developer magazine is now posted online. In September of 2015, I wrote a column about the introduction of a new product type to the home building marketplace: the single-family home for rent, otherwise known as build-to-rent (B2R). At that time, just a few builders, including Lennar and Toll Brothers, had dipped their toes into these waters, but today it’s being seen as a clever hedge against the boom-and-bust real estate cycles which can test even the best-run companies. To be sure, it’s not just homebuilders getting into this game. Wall Street-backed companies like Invitation Homes and AmericanHomes4Rent started the trend by buying up cheap, existing single-family homes in foreclosure back in 2012 when home prices were near their lowest, eventually assembling a portfolio of 200,000 units across the country. Even with that rapid growth, their holdings still represent just 1.4 percent of the estimated 14 million single-family rental homes, with most owned by small “mom and pop” operators. The Small Business Optimism Index posted its sixth highest reading in survey history for the month of June, at 107.2, down 0.6 from May. Since December 2016, the Index has averaged an unprecedented 105.4, well above the 45-year average of 98 and rivaling the all-time high of 108.0 in July 1983. Consumer borrowing picked up in May, with total consumer credit increasing at an annual growth rate of 7.6%, which is the fastest pace of credit growth since November. Most of this was due to revolving credit, like credit cards, which rose by 11.4% in May, and indicating consumers are willing to increase their spending after a slow first quarter of the year. 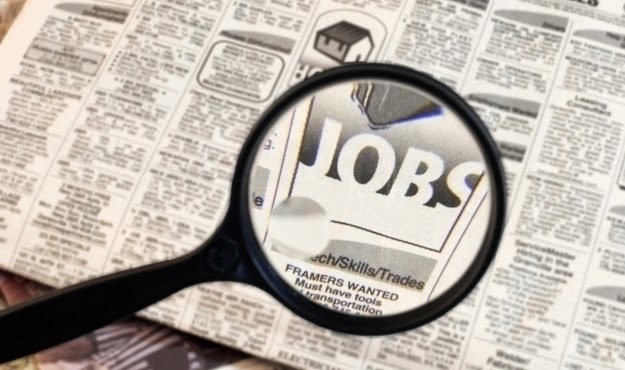 The number of job openings edged down 3.0 percent to 6.6 million on the last business day of May. Over the month, hires rose 3.1 percent to 5.8 million, while separations rose 0.8 percent to 5.5 million. 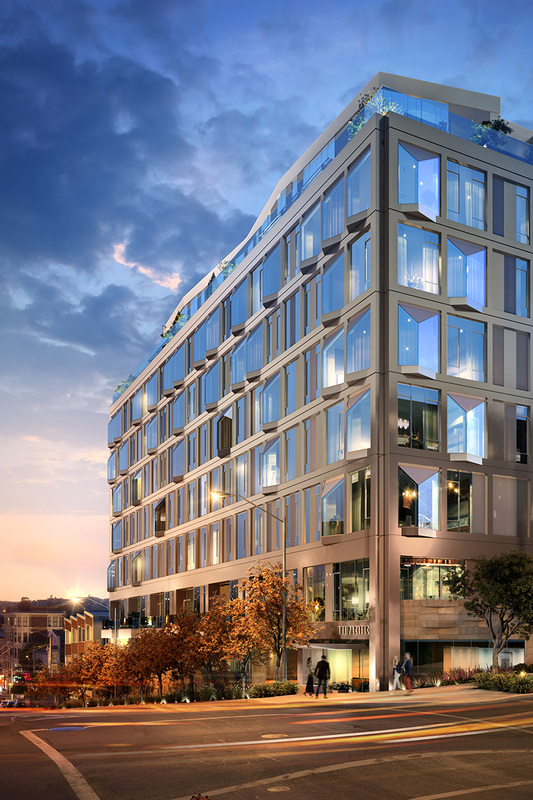 One of the things I like best about the building industry is the enormous creativity involved in every stage of the process, especially for decisions made about architecture, design and land use. This was certainly true again for this year’s Gold Nugget winners at PCBC, ranging from rehabs which are both practical and inspiring, to master plans which seemed to effortlessly take the pulse of today’s culture while still making them relevant to future residents. Following are some profiles of winners in key categories. There were actually two winners for Best Masterplan Community, divided among urban and suburban locations. 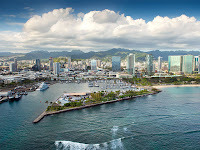 In Honolulu, Ward Village by Howard Hughes Corp. re-imagined a 60-acre parcel once known for heavy industry and commercial fishing into the largest certified LEED-ND Platinum (Neighborhood Development) project of its kind in the U.S. 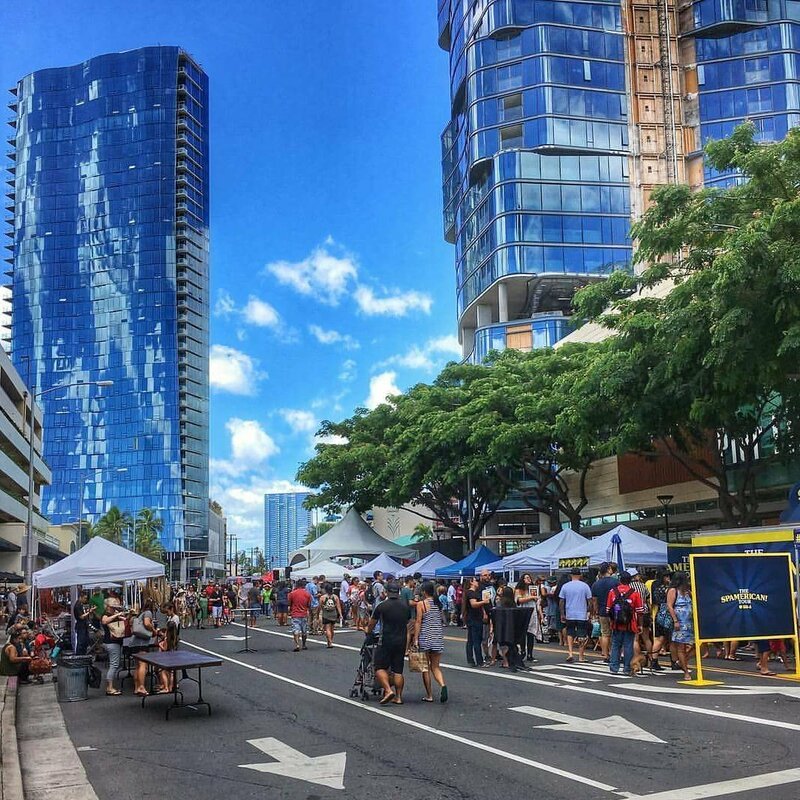 In between the downtown area and the 30-acre Kewalo Harbor, 4,500 residential units, over one million square feet of retail space, a central plaza and rail station will emerge. 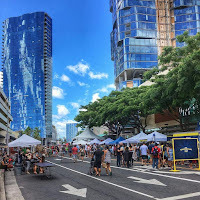 Best of all, by including scores of existing businesses in this redevelopment, Ward Village demonstrated clear respect for the local culture and history. Yet it was Rancho Mission Viejo’s Esencia in Southern California which took multiple awards for not just Best Masterplan, but also Best Community Land Plan and Best Recreational Use Facility. The true challenge here was how to best respect the terrain and ranching history of this 890-acre plan while still being able to develop nearly 2,750 homes, 60 acres of retail space and over 16 ranch-themed gathering places, clubhouses and Nature Center. But the true selling point for Escenia was its integration into the 17,000 acres of an open space preserve, which will eventually become part of the 33,000-acre Southern Subregion Habitat Reserve, one of California’s largest. The land plan itself was noted for retaining ranch elements including a yurt campground, oak groves, hillside trails and farming, all of which are intended to inspire future generations to respect the land. 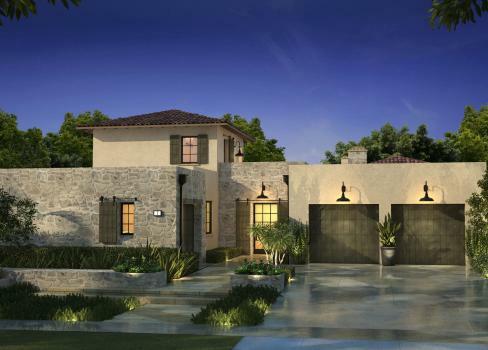 In nearby Newport Coast, The New Home Company took top honors for Best Residential Detached Collection with Coral Canyon, an exclusive enclave of 27 homes offering canyon views with a resort feel. Reportedly inspired by the easy pace of life on the Spanish island Ibiza, judges cited the way in which each home effortlessly blended into the next, creating a cohesive and memorable street scene characterized by neutral colors, bright interiors and flat roofs on all single-story elements. For an individual, single-family home, it was Plan 9502 at Camelot Homes’ White Horse in Scottsdale, AZ which was named Home of the Year. 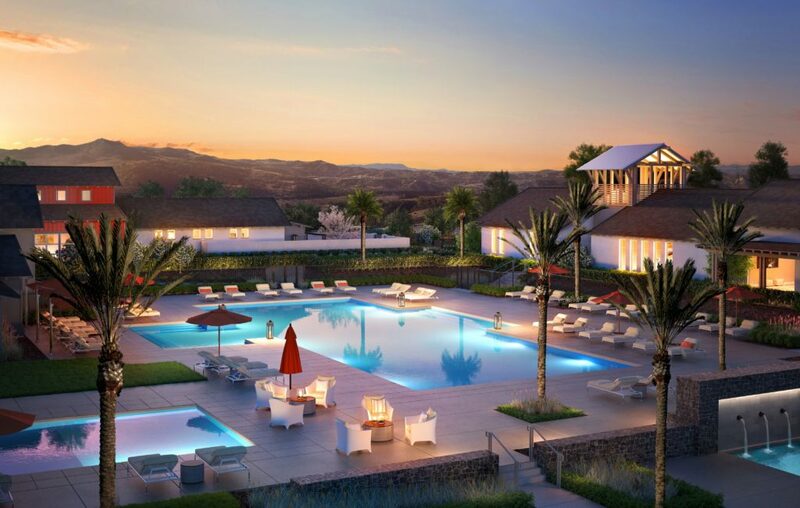 In this case, judges cited the way in which this plan updates the classic hacienda footprint into a modern feel, with numerous indoor-outdoor spaces to take advantage of the local climate. Clever designs also abounded in the multi-family space, with Trumark Urban’s The Pacific winning Best Multi-Family Community due to what judges said was “transforming what was a detractor and neighborhood eyesore to an exemplary display of positive change.” What Trumark was able to do was transform a mid-rise, 1960s-style school of dentistry in the middle of the upscale, built-out community of Pacific Heights in San Francisco into 76, LEED Gold-certified luxury condos and townhomes. 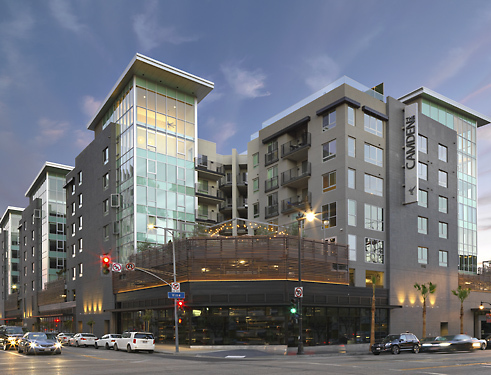 They did this by breaking up the previous, Brutalist exterior with a modern take on the classic bay window, repurposing a mechanical building on the roof into four penthouses with terraces, and masking the adjacent parking structure with ten, three-story townhomes. This lower elevation helped better tie the entire project into the lower-density neighborhood, while also improving the overall streetscape. Finally, it was The Camden’s combination of 287 upscale apartments, a 40,000-square-foot Equinox health club and multiple gathering spaces to maximize socializing which earned this project by Camden Development top honors for Best Mixed-Use Project. 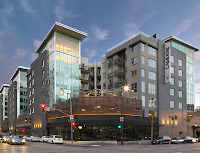 Built on the site of Paramount Pictures’ first production building in the heart of Hollywood, CA, The Camden not only captures this entertainment-oriented history on a public art wall at the base of each tower, but intentionally markets its units to the young and local ‘industry’ types as not just a home, but also a very convenient place to network.